Is it really ten year's since David Alden's production of Donizetti's Lucia di Lammermoor debuted at English National Opera? 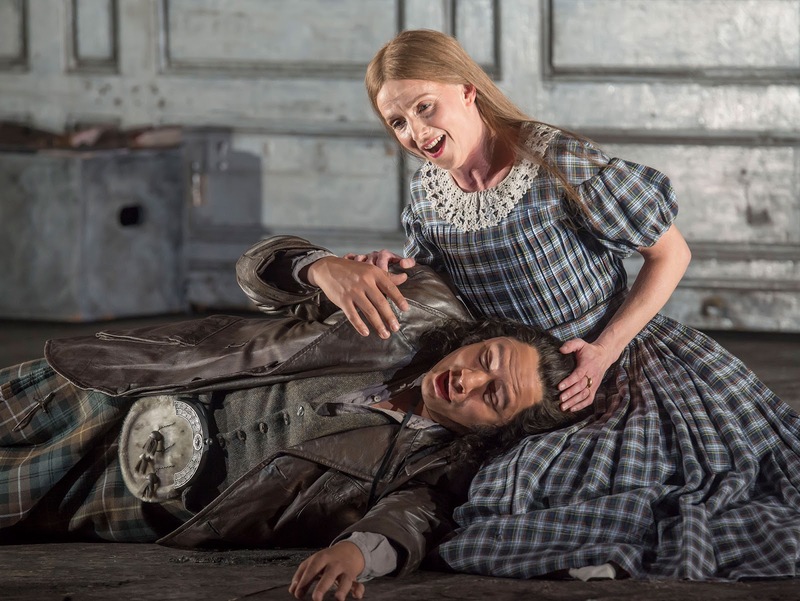 The production has made a welcome return to the London Coliseum (seen Tuesday 30 October 2018) where we do not see nearly enough of Italian bel canto in its serious vein. 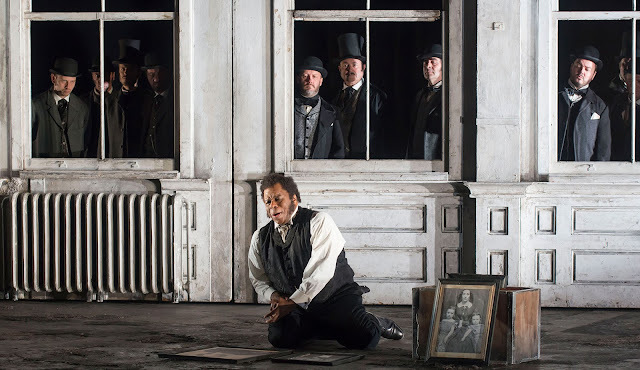 Whatever the production's drawbacks, the big advantage is that Alden treats Donizetti's work as serious drama, and manages to mine some striking and disturbing veins in the piece. This time around, Lucia was sung by Sarah Tynan with Eleazar Rodriguez as Edgardo and Lester Lynch as Enrico, plus Michael Colvin as Arturo, Clive Bayley as Raimondo, Sarah Pring as Alisa and Elgan Llyr Thomas as Normanno, Stuart Stratford conducted. From the outset, Alden created a strikingly disturbing atmosphere with the help of Charles Edwards 'abandoned mental institution' style sets. It is not just that all is not well at Ravenswood, but Alden makes Lucia a commoditised and infantilised figure, supposedly kept under control by her family until passed on to a chosen husband. I am not sure that the suggestions of incestual interest on Enrico's part in Act Two are necessarily a good thing, but this points up one of the weaknesses of Alden's approach. He is never able to hint or suggest, instead, he presents us with a clear narrative and every scene tells us what to think. I feel that the production would be stronger if there was less detail, less fussy, stylised stage business and that the audience was given room to make up their minds for themselves. Within these limitations, Alden and Stratford drew a strong and absorbing performance from their cast. This is a long opera, and ENO did a full version, two and a quarter hours of music, including the opening scene of Act Three which always used to be traditionally cut. And we weren't just along for the singing, though that was superb, but for the drama too. There are some works which hover on the edge of the repertoire without ever appearing, and it is often ironic that when such works appear it is often in clusters. Such is the case with Dame Ethel Smyth's Mass in D, not only is it being performed by the BBC Symphony Orchestra and Chorus at the Barbican, but Dominic Ellis-Peckham will be conducting at at Southwark Cathedral on 3 November 2018. The concert is part of the choir's five15 initiative championing the work of women composers. 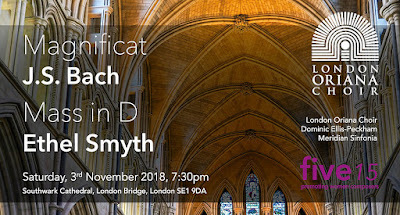 At Southwark Cathedral, Dominic Ellis-Peckham will conduct the London Oriana Choir and Meridian Sinfonia in Smyth's Mass in D and the Magnificat by J S Bach, and the concert is preceded by a pre-concert talk given by the renowned expert Dr Christopher Wiley from the University of Surrey. Ethel Smyth composer her Mass in D following a reading of Thomas a Kempis' The Imitation of Christ whilst ill in Munich; The book belonged to her Catholic friend Pauline Trevelyan, to whom Smyth dedicated the Mass. She composed much of it while a guest of Empress Eugénie at Cape Martin, near Monaco, in the summer of 1891. 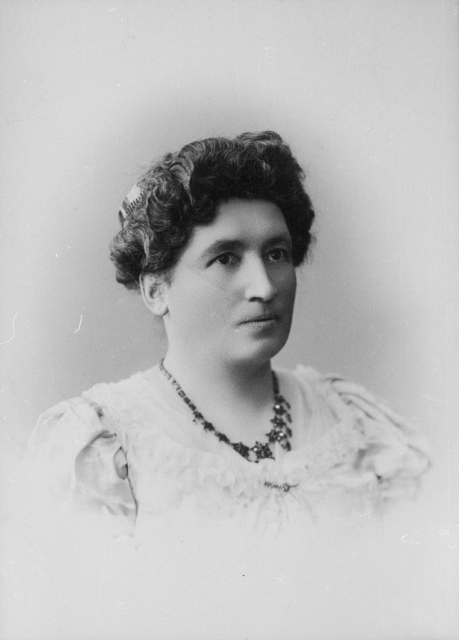 It was thanks to Empress Eugénie's support (and her connections with the British Royal family) that Smyth was able to have the mass premiered at the Royal Albert Hall in 1893. The mass received a number of performances in the 1920s and 1930s, following Adrian Boult's performance of the work in Birmingham, and Sir Thomas Beecham conducted it in 1934 as part of the celebrations for Smyth's 75th birthday. The mass is a large-scale concert work (though Smyth wrote it following a renewal of her belief, it was never intended as a liturgical piece), for chorus, soloists and orchestra. Though the published score places the Gloria second, Smyth's preference was for this movement to come at the end so that the piece could end triumphantly! Though Smyth devoted the majority of her musical career to opera, she returned to large-scale choral music at the end when she produced her large-scale symphonic cantata The Prison which was based on the writings of Henry Brewster (HB) who had been the great love of her life, and who had written the libretto (originally in French) of The Wreckers. The Prison would be one of Smyth's last works, as she went deaf and by the time of the 75th birthday celebrations in 1934 she was entirely unable to hear the music or the adulation of the crowds. Choral at Cadogan on Monday 29 October 2018 brought visitors from New Zealand to the Cadogan Hall in the form of Voices New Zealand Chamber Choir, conductor Dr Karen Grylls whose programme brought a mixture of New Zealand, European and American composers, combined with the artistic talents of Horomona Horo who interpolated his own compositions and improvisations on Maori instruments throughought the programme. 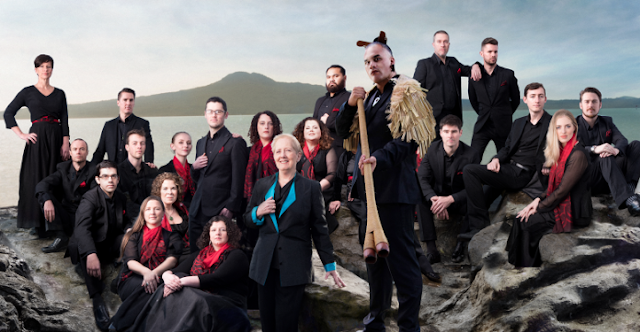 Besides Horo, the New Zealand composers we heard were David Childs, David Griffiths, Helen Fisher and David Hamilton, along with music by Hildegard von Bingen, Princess Te Rangi Pai (Fannie Rosie Howie), Mark Sirett, Jean Absil, Jaakko Mantyjarvi, and Samuel Barber. 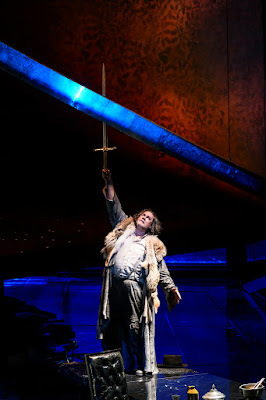 A poetic Walküre with a towering performance from Stuart Skelton. On Sunday 28 October 2018, Barbican’s Cinema 2 saw the broadcast of Keith Warner’s Royal Opera production of the first day of Wagner's Der Ring des Nibelungen, Die Walküre. In this revival the ill-fated twins Siegmund and Sieglinde were sung by Stuart Skelton and Emily Magee. Sieglinde’s Neiding husband, Hunding, was Ain Anger. Mr. and Mrs. God, Wotan and Fricka, were John Lundgren and Sarah Connolly. Brünnhilde, Wotan’s favourite daughter, was Nina Stemme. Her sister Valkyries were Alwyn Mellor, Lise Davidsen, Kai Rüütel, Claudia Huckle, Maida Hundeling, Catherine Carby, Monika-Evelin Liiv and Emma Carrington; and I haven’t heard them better sung. Antonio Pappano conducted. I am not so down on Keith Warner’s production as some have been. OK, its imagery is at times frustratingly opaque and its symbolic complexity cluttered, naff even; but, the conflicts of love and power are played out with utter conviction. It is, dare I say, Ibsenesque in approach, the dissection of the characters’ relationships line by line was as precise as its visuals were symbolic detritus. It felt as if every musical effect was rendered in the emotional landscape. The action was swept along by rivers of sound from the pit. The music breathlessly ebbed and flowed in Pappano’s fluid and elegant reading. This was immersive stuff. There were a few hiccups – it is a long evening after all. Emily Magee’s Sieglinde seemed to lapse into histrionics like some femme fatale and at times didn’t sound vocally comfortable. Ain Anger as her husband was more a brooding introvert than a menace. Peter Wiegold's wonderful Club Inégales opens its Autumn season, The Uncertain Hour, on Thursday, 1 November 2018 when singer/actor Sarah Gabriel joins Peter Wiegold and Notes Inégales for a programme of Brecht and Weill. There will be some of their music theatre pieces as well as Peter Wiegold's settings of Brecht's poetry and political manifestos. And if you can't get along to the club, then there is their forthcoming disc with folk-singer Sam Lee to look forward to, Van Diemen's Land. Further ahead, they join with the EFG London Jazz Festival for The Edge of the Abyss at the Royal Academy of Arts in Piccadilly. Back at Club Inégales's home in Euston, the second collaboration with the jazz festival includes composer/saxophonist Helen Papaioannou, saxophonist James Mainwaring and bass Shri Sriram (a key member of Asian Underground scene with Badmarsh&Shri, who recently won a British Composer Award for “Just a Vibration”, a collaboration between Indian musicians and brass band!). Peter Knight, director of the Australian Art Orchestra, is guest in December and Peter Knight will be adding his trumpet/electronics to the mix with Alice Zawadzki (violin, voice), and they will be performing The Plains, 'an extraordinary series of musical mirages that form on an endless sonic horizon reflecting and reimagining the wide-open spaces of the Australian landscape’. 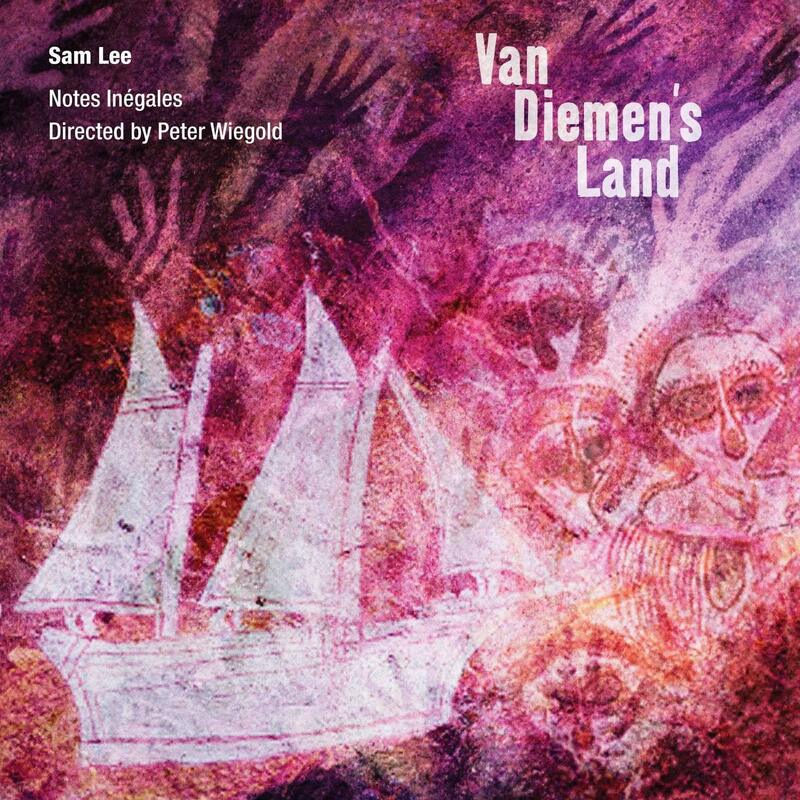 Finally on 13 December 2018, folk-singer extraordinaire, Sam Lee joins Peter Wiegold and Notes Inégales for the launch of their album Van Diemen's Land. This disc is a wonderful re-imagining, taking Sam Lee's folk-inspired vocals into new lands and territories with some magical instrumental textures from Peter Wigold (director and keyboard), Fraser Fifield (pipes and saxophone), Max Baillie (violin), Joel Bell (guitar), Ben Markland (bass),Simon Limbrick (percussion), and Martin Butler (piano). There are nine tracks on the disc and they arise out of live performances with Lee in 2014. Thanks to the varied experience of the members of the band, classical, jazz, folk, Scottish music and more, the results are intriguing and flexible. And on disc, Wiegold and his musicians have successfully re-captured the live, freely improvised feel which is Notes Inégales trade-mark. If you think you know what folk music sounds like and don't like it, then think again. This really is a journey to the unknown, and wonderful it is too. Full details of the latest season from the Club Inégales website. Van Diemen's Land is released on 16 November 2018, available from Amazon. Next year, Opera North's Howard Assembly Room at the Grand Theatre in Leeds celebrates its 10th anniversary (doesn't time fly). And for the 2018/19 season they have assembled a fine array of chamber music, song and more in anticipatory celebration. 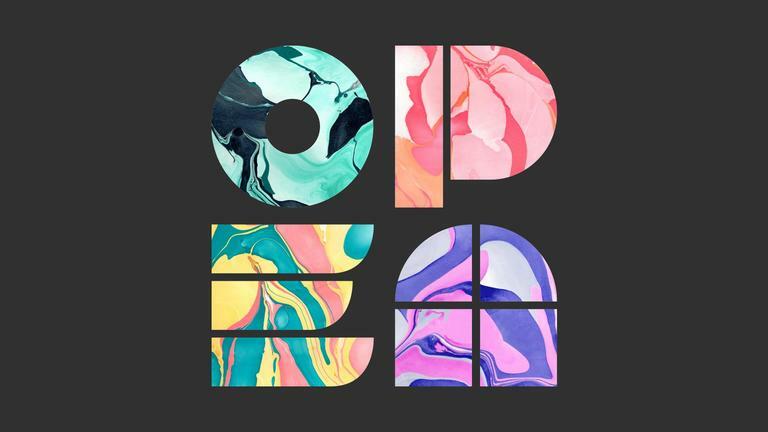 The programme runs until March 2019 when the venue will close (temporarily) as part of Opera North's ambitious renovation programme at the Grand Theatre. 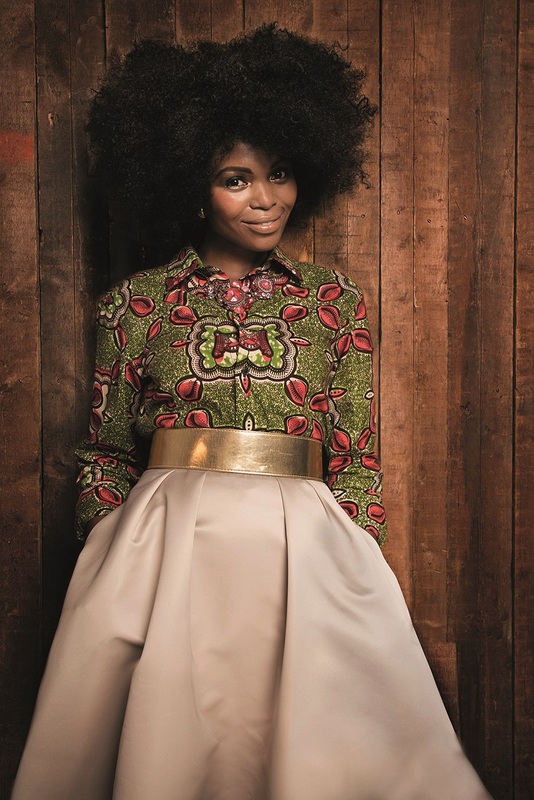 Things kick off on 31 October 2018 with South African soprano Pumetza Matshikiza and pianist Simon Lepper in Schumann (Frauenliebe und -leben and songs from Myrthen), Richard Strauss's Four Last Songs and songs from South Africa. In November, baritone Chrisopher Maltman is accompanied by Joseph Middleton, director of Leeds Lieder, in the first of two recitals produced in collaboration with Leeds Lieder. Maltman and Middleton will be performing music on the subject of war by composers from both sides of the divide in World War One, including music by Butterworth, Gurney, Mahler, Fauré, Ives, Mussorgsky, Schumann, Wolf and Poulenc. The in January, Joseph Middleton returns with soprano Catriona Morison for a programme of Brahms, Schumann and Mahler. In December there is a chance to hear the current intake of young artists at the National Opera Studio, performing Last Days devised by Tim Albery, a programme marking the centenary of the end of World War One, with music by Berg, Satie, E.E Cummings, Elgar, Butterworth and Gurney, among others, accompanied by members of the orchestra of Opera North. Other visitors include pianists Piers Lane and Joanna MacGregor, Early Music vocal ensembles The Tallis Scholars, Tenebrae, The Cardinall's Musick, and string quartets Fitzwilliam String Quartet and the Opera North String Quartet. These latter two are performing a special programme on 7 February 2019 to mark the Howard Assembly Room's 10th anniversary. A new co-production by Opera North and Leeds Playhouse, Not Such Quiet Girls, tells the stories of three women on the front line during World War I. Bringing together an all-female chorus and three female actors, this new musical drama, written by Jessica Walker with musical arrangement by Joseph Atkins. The piece forms a complement to Opera North's performances of Kevin Puts' Silent Night at Leeds Town Hall. This disc from Alpha Classics has the name Palazzetto Bru Zane attached, so we know that it will be an exploration of some aspect of 19th century Romantic French opera, almost certainly something we might not have heard before and ought to have. The name of the disc Confidence does not really shed any light, and the range of operas is wide with works by Gounod, Delibes, Messager, Victorin Joncieres, Augusta Holmes, Bizet, Benjamin Godard, Franz Lehar, Chabrier, Ambroise Thomas, Duparc and Charles Trenet! 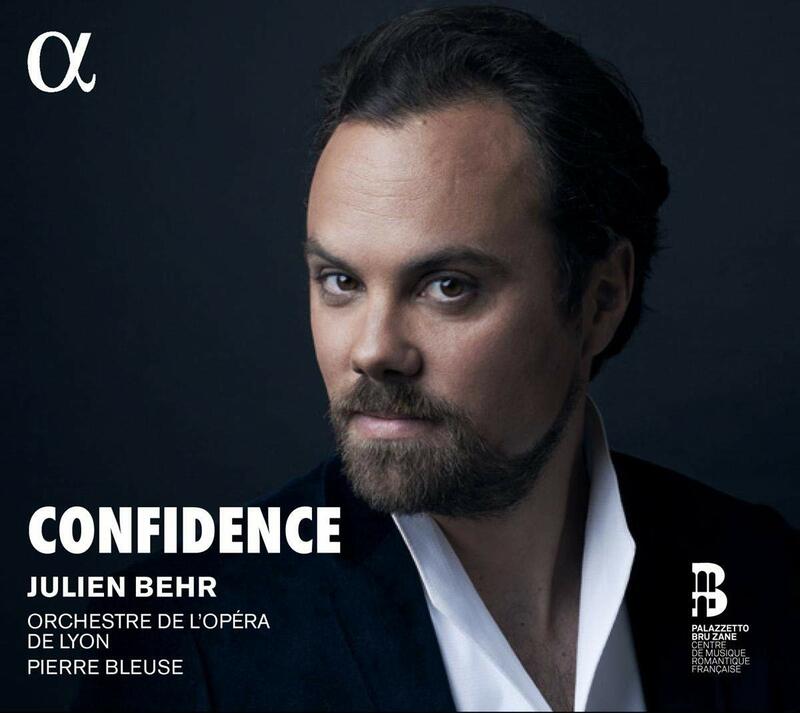 The performer is the tenor Julien Behr, with the Orchestre de l'Opera de Lyon conducted by Pierre Bleuse. In fact the three orchestral works apart (Duparc's Aux etoiles, Augusta Holmes La Nuit e l'Amour and Chabrier's Habanera), all the operas on the disc were presented at the Opera Comique, some are familiar such as Delibes' Lakme, and Thomas' Mignon, others are familiar names though the works themselves are less so, Messager's Fortunio Bizet's La Jolie Fille de Perth, Godard's Jocelyn (the latter two very much one-hit wonders), whilst others are barely even names, Gounod's Cinq Mars, Delibes' Jean de Nivelle, Joncieres' Le Chevalier Jean. And then there is the Viennese operetta given in French, Lehar's Le Pays du Sourire and La Veuve Joyeuse. What the disc, in fact, explores is a particular voice type which developed at the Opera Comique in the latter half of the 19th century, the grand tenor d'opera comique or tenor de demi-caractere. London Bach Society's 28th Bachfest, artistic director Margaret Steinitz, takes places 31 October - 6 November 2018 at St George's Church, Hanover Square, the Gresham Centre, and St John's Smith Square. The resident ensemble at the festival is the Steinitz Bach Players, an ensemble celebrating its 50th anniversary having been founded in 1968 by Paul Steinitz. 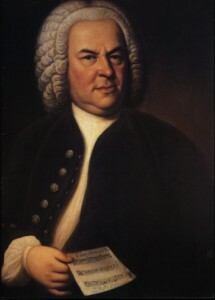 The Steinitz Bach Players will be performing Bach's Musikalisches Opfer/Musical Offering directed by violinist Rodolfo Richter, and a programme which includes cantatas BWV 60 and BWV 151, Double Violin Concerto and Brandenburg Concerto No 1, with soloists Rowan Pierce, Anna Harvey, Nick Pritchard, Benjamin Bevan, Rachel Beckett (flute), Anthony Robson (oboe d’amore), Ursula Paludan Monberg (horn), Jane Gordon (violin). Viola da gamba/cello player Peter Wispelwey and harpsichordist Mahan Esfahani will make their debut as a duo at the festival performing Bach's sonatas for viola da gamba and harpsichord. 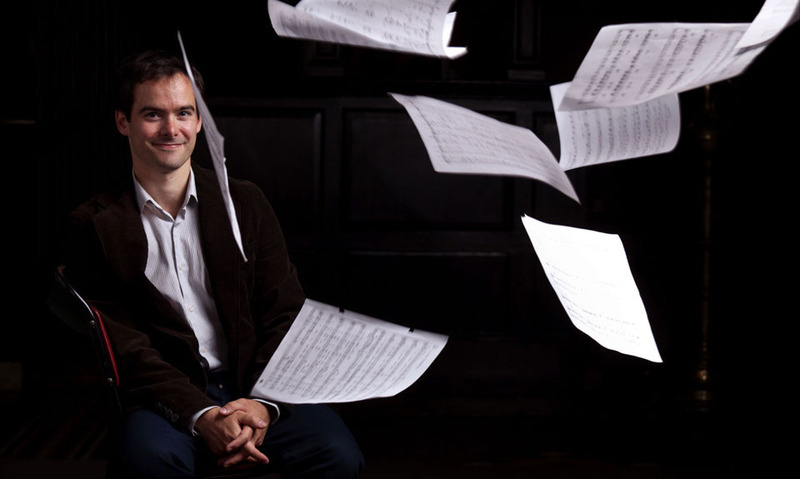 The festival emerging artists series includes concerts from Nicholas Morris (organ) - Assistant Director of Music at St George’s Hanover Square, Samuel Ali (organ) - Assistant Director of Music at Christ Church, Chelsea, classical guitarist Laura Snowden, and the Magnard Ensemble wind quartet. Whilst it is not a rarity, performances of Vincenzo Bellini's Norma (libretto by Felice Romani) are certainly not common and Chelsea Opera Group gave us a welcome chance to hear the piece in concert at the Cadogan Hall last night, 27 October 2018. 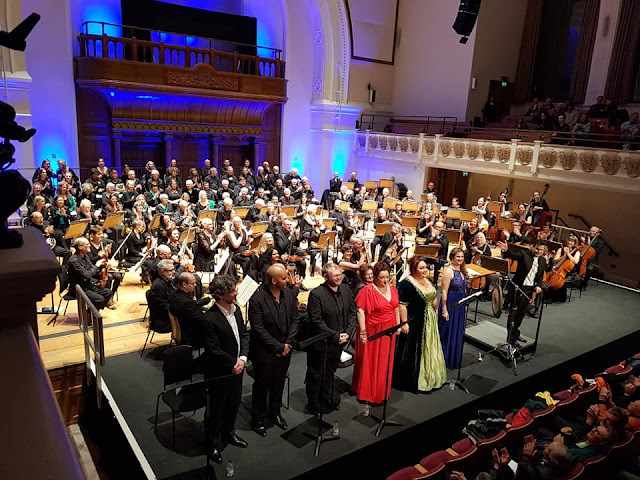 Dane Lam conducted the Chelsea Opera Group orchestra and chorus with a strong cast with Helena Dix as Norma, Elin Pritchard as Adalgisa, Christopher Turner as Pollione, Joshua Bloom as Oroveso and Claire Pendleton as Clotilde. Dane Lam conducted Mozart's Cosi fan Tutte at Opera Holland Park earlier this year [see my review] and conducted Bellini's Norma there in 2014 [see my review]. From the opening notes of the overture at Cadogan Hall he gave us an account which was lithe, propulsive and dramatic, but which had a nice flexibility when it came to Bellini's long melodic lines. Helena Dix, who sang Abigalle in Verdi's Nabucco with Chelsea Opera Group in 2017 [see Anthony's review], is a soprano who counts in her repertoire dramatic coloratura roles like Verdi's Abigaille and Odaballa (Attila), and jugend-dramatisch roles such as Elsa in Wagner's Lohengrin and the title role in Strauss' Ariadne, yet also sings the title role in Donizetti's Anna Bolena. So her Norma lacked neither power nor technique. She was also able to spin a very fine line, so that though the dramatic moments were full of impact, we also had plenty of quietly shaped long lines. 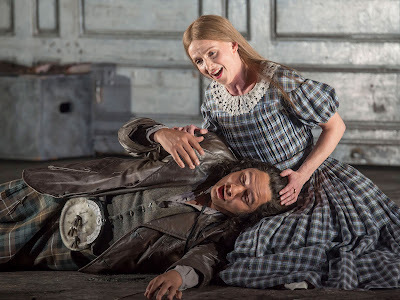 Dramatically, this was a very complete performance, Dix made great use of the words (something that does not always happen with sopranos with strong coloratura technique), and was Norma in every moment, whether singing or not. She has a very expressive face, and though quite static (this was a concert performance), made the drama count. Perhaps the voice lacked the ultimate in variations of dramatic colour, but there was so much to enjoy here. 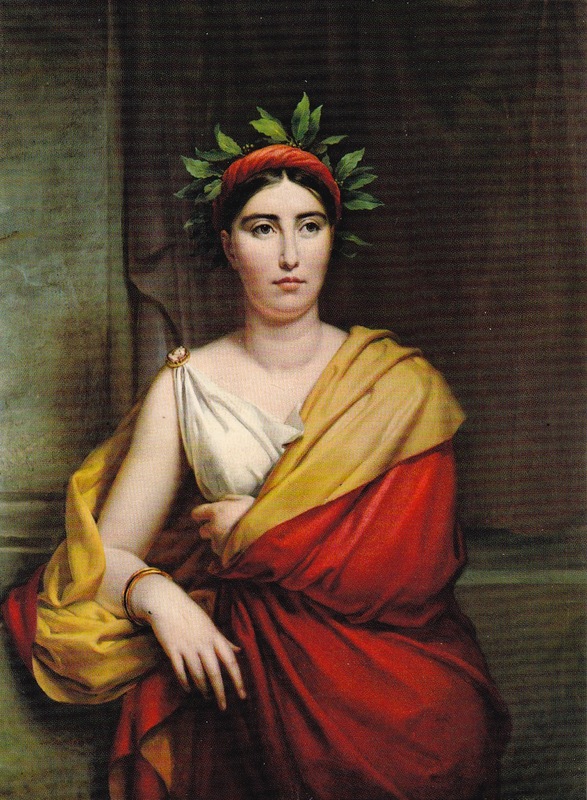 I liked the fact that when she remembered her early love of Pollione in 'Ah, bello a me ritorna' in her opening scene, she was positively girlish yet was furiously vengeful when Pollione and Adalgisa's treachery was discovered. Dix's attention to line, word and drama counted for much in the crucial opening scene of Act 2, when she contemplated killing her children. 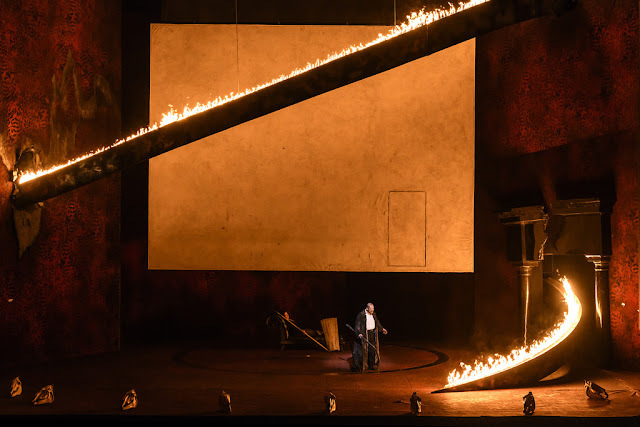 But it is where the centre of the role lines, the pair with Adalgisa and the remarkable sequence of lyric duets between Norma and Pollione which conclude the opera. The casting of Norma presents something of a challenge. For all its position as central to the soprano repertoire, the role of Norma was first sung by a singer who may well have been a mezzo-soprano with a high extension. The first Adalgisa was a soprano who would later sing the role of Norma, yet in the duets the role of Adalgisa lies below that of Norma. Traditional casting uses a mezzo-soprano Adalgisa, but modern performances sometimes revert to soprano as did Chelsea Opera Group. Last month I talked to conductor William Vann, who is masterminding the first full performance of Sir Hubert Parry's oratorio Judith in London since the 19th century [see my interview], and on Thursday William presented an evening introducing the composer and his oratorio to friends and supporters. Mezzo-soprano Kathryn Rudge and William Vann performed the aria Long since in Egypt's plenteous Land from Judith (Rudge will be singing the aria in the complete performance on 3 April 2019). The tune of the aria is familiar as in the 1920s it was re-used to become the hymn-tune used with the words 'Dear Lord and Father of all mankind'! We also heard the first movement of Parry's Cello Sonata in A Major (which dates from 1880, eight years before Judith) performed by Julia Desbruslais (cello) and William Vann. Julia Desbruslais is the principal cellist and executive director of the London Mozart Players (and LMP will be performing in Judith on 3 April). And Kathyrn Rudge, Julia Desbruslais and William Vann joined together to perform a work by Brahms, a composer much revered by Parry, Gestillte Sehnsucht Op.91, No.1 (originally written for mezzo-soprano, viola, piano). Kathryn Rudge and William Vann finished the evening with a group of English songs by younger contemporaries of Parry, including his students like Herbert Howells and Frank Bridge. Prof. Jeremy Dibble [whom I recently interviewed about the revival of Stanford's Mass Via Victrix] provided a spoken introduction to Parry and his oratorio, making it clear that the oratorio was relatively ground breaking in Parry's output. It was his first essay in the genre, coming in 1888 at a time when he was still something of a challenging younger composer (he was 40) and coming after the great success of Blest Pair of Sirens. Parry's Judith is at the Royal Festival Hall on 3 April 2019, William Vann conducts the Crouch End Festival Chorus and London Mozart Players, with soloists Eleanor Dennis (soprano), Kathryn Rudge (mezzo-soprano), Toby Spence (tenor) and Henry Waddington (bass). Full details from the Southbank Centre website. 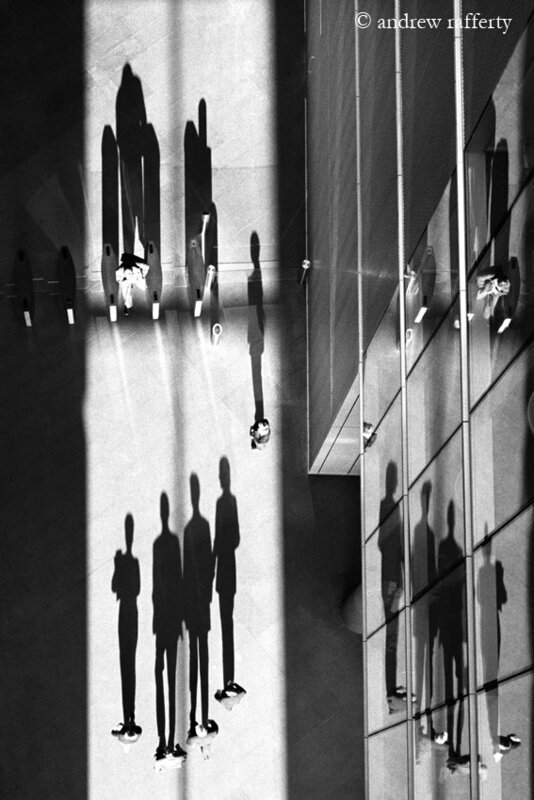 Psappha is Manchester's own ensemble specialising in music by living composers. Psappha is unique in its artistic offering as the North of England’s only stand-alone, professional contemporary classical music ensemble. 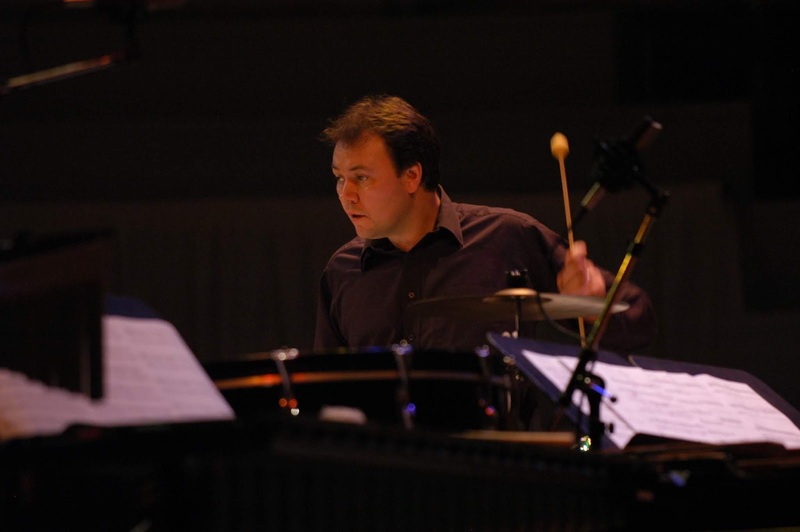 Artistic director and percussionist Tim Williams founded ensemble, 27 years ago specifically because there was no outlet for contemporary composers in Manchester, but also because he was fascinated by new music. And there is even more need for such a group now, as there are more composers based in Manchester and the North-West. I recently spoke to Tim, via Skype, to talk about the ensemble, its approach to concert making and development of new music. The group's 2018/19 season started on 27 September 2018 with New Adventures at the Stoller Hall in Manchester, and runs to Bosnian Voices on 2 May 2019, and it is Tim who is responsible for selecting the repertoire. The first concert, New Adventures programmed four iconic 20th century works by Lutoslawski, Bartok, Kurtag and Ligeti, and people enjoyed it. In fact, the group does not have a typical composer, and it works with a wide range and Tim feels that there is now more variety than there was in the 1960s, something which he enjoys. Two recordings from the concert have already found there way onto Psappha's YouTube channel, Bartok's Sonata for Two Pianos, and Lutoslawski's Variations on a Theme of Paganini. Judith Bingham's A walk with Ivor Gurney was commissioned by the choir Tenebrae and performed by them, with mezzo-soprano Dame Sarah Connolly, at Gloucester Cathedral in 2013 at a concert to raise money for the Ivor Gurney window in the cathedral. It is a substantial piece for solo mezzo-soprano and choir, and as such provides something of a challenge to programmers when it comes to surrounding it with suitable repertoire. 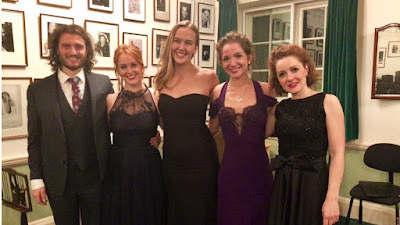 As part of Sarah Connolly's residency at the Wigmore Hall, she joined with Tenebrae, conductor Nigel Short, to perform Judith Bingham's A walk with Ivor Gurney on Wednesday 24 October 2018, at a concert which sought to evoke Gurney's connection with the Gloucestershire landscape via his musical connections. So we had songs by Gurney, sung by Sarah Connolly with Eugene Asti at the piano, By a bierside, In Flanders and Sleep, Elgar's anthem They are at rest (dating from 1909), Herbert Howells' Take him, earth for cherishing and Gurney's own anthem Since I believe in God the Father Almighty (from 1925). 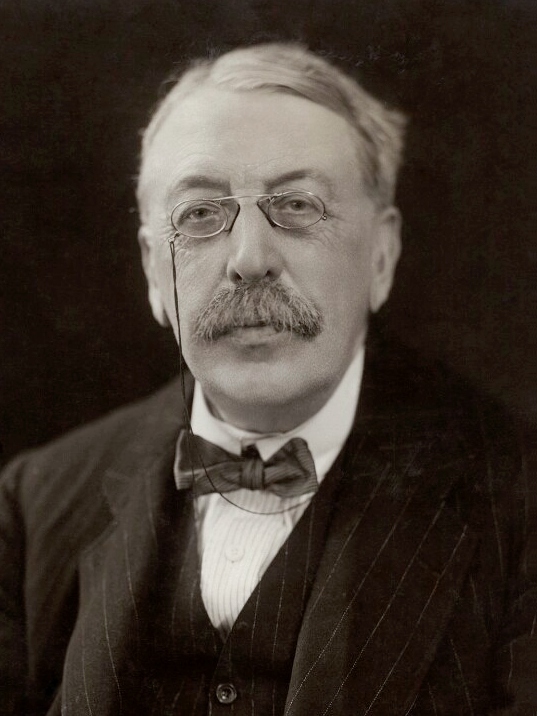 In the second half we had the Songs of Farewell by Hubert Parry, who along with Stanford was a profound influence on the young British composers. The programme finished with another work from the same period, but one across the divide, Arnold Schoenberg's Friede auf Erden. 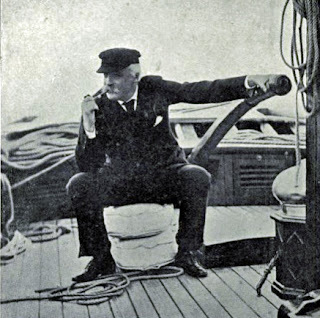 Elgar's part-song-like They are at rest sets works by Cardinal Newman, it is a beautifully crafted piece with harmonies very redolent of Elgar despite the work's apparent simplicity. Ivor Gurney's 1925 setting of a poem by Robert Bridges, Since I believe in God the Father Almighty was remarkable for the free-thinking agnosticism of the text. It was rather a stark piece, with strong and very distinct harmonies which created an effect which was not quite comfortable. We continued with Gurney with a pair of wonderfully direct and deeply felt performances of songs, By a bierside and In Flanders, from Sarah Connolly and Eugene Asti. The combination of clear words and strongly shaped tone made a strong impression. 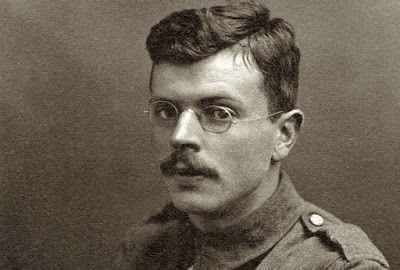 Judith Bingham's A walk with Ivor Gurney takes Gurney's own walks through the Gloucester countryside as its inspiration by setting a sequence of extracts from Gurney's own poems. A new choral work by composer Stephen McNeff and poet Aoife Mannix is being premiered by Canticum Choir, conductor Mark Forkgen, at the church of St Martin in the Fields, Trafalgar Square, London on 30 October 2018, as part of a programme which also includes Mozart's Requiem. McNeff and Mannix's Walking in the Shadows is written to coincide with the centenary of the end of the First World War and the piece tells the story of four people in a landscape of war. 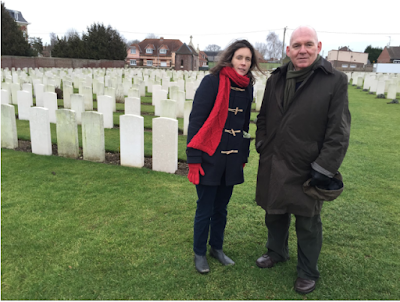 McNeff and Mannix researched it by visiting Northern France and Flanders to help us understand how the War affected not only the combatants, but those who nursed them and what it all meant for the people back home. 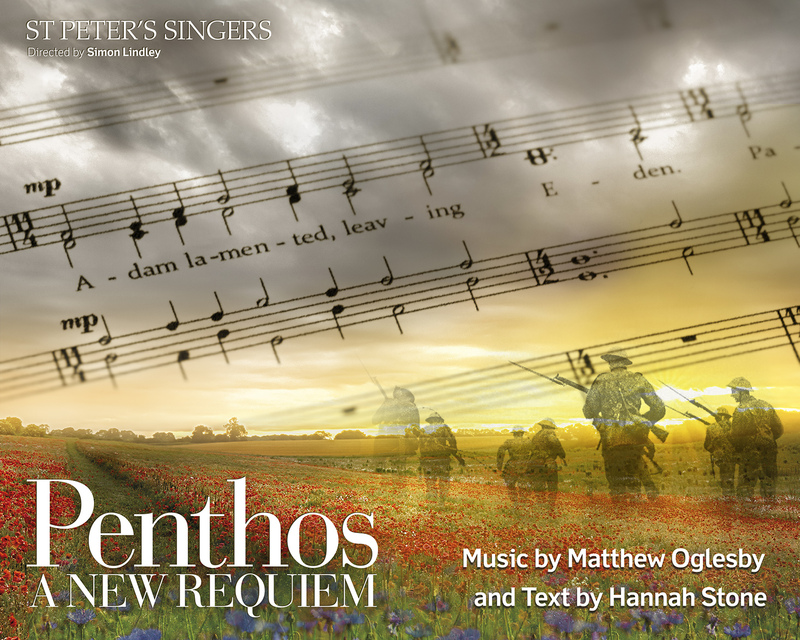 Unusually for a First World War commemorative choral work, McNeff and Mannix come at it from an angle and tell the stories of four very different individuals caught up in the maelstrom of conflict. The piece is in fact, the first libretto that Aoife Mannix has written, though she has written quite a lot of performance poetry performed with live music. You can read more about it on Aoife Mannix's blog posting. The programme is completed by Mozart's Requiem with Mark Forkgen conducting Canticum and Counterpoint with soloists Lucy Bray, Amy Lyddon, Michael Bennett, and Steffan Lloyd Owen. Full details from the St Martin in the Fields website. Art 50 is a collaboration between Sky Arts, the Barbican Centre, Sage Gateshead and the BALTIC Centre for Contemporary Arts in which 50 artists, from a variety of artistic disciplines, were commissioned to examine the question of what it means to be British today from a variety of perspectives. As part of a weekend-long programme showcasing the results on 23 & 24 February 2019, the Barbican will be presenting Barbican OpenFest: Art 50 on Saturday 23 February 2019, whilst BALTIC Centre for Contemporary Arts and Sage Gateshead host a selection of performances on Sunday 24 February. The Barbican programme will include the premiere of Nitin Sawhney’s 'BREXIT' – A rational anthem for a national tantrum, which reflects the highs and lows of 'Brexit Britain', performed by Nitin Sawhney, members of his band, the National Youth Orchestra of Great Britain (NYO) and choirs from another project on the programme, the British Songbook. When We Collide: A British Songbook, by Hanbury & Groves brings to life Britain’s passion for music by transforming interviews with choir members from across the country into a musical piece which will be performed live at the Barbican and Sage Gateshead. Other events include poet Lemn Sissay’s Constitution for the UK, exploring the possibility of a ‘new charter’ for the UK, Boy Blue’s REBEL, a new dance and film production incorporating music, dance and performance poetry, a pop-up cinema of films and animation shorts, including Matty Crawford’s His England which follows a young Asian British boy questioning his home and identity, as well as writers including Paul McVeigh, Dreda Say Mitchell and A.L. Kennedy imagining what England, Ireland, Northern Ireland, Scotland and Wales might look like 50 years from now. This significant new disc from the Austrian label Paladino Music consists of three major orchestral works by the contemporary British composer Kenneth Hesketh, Knotted Tongues, Of Time and Disillusionment and In Ictu Oculi performed by the BBC National Orchestra of Wales, conductor Christoph-Mathias Mueller. 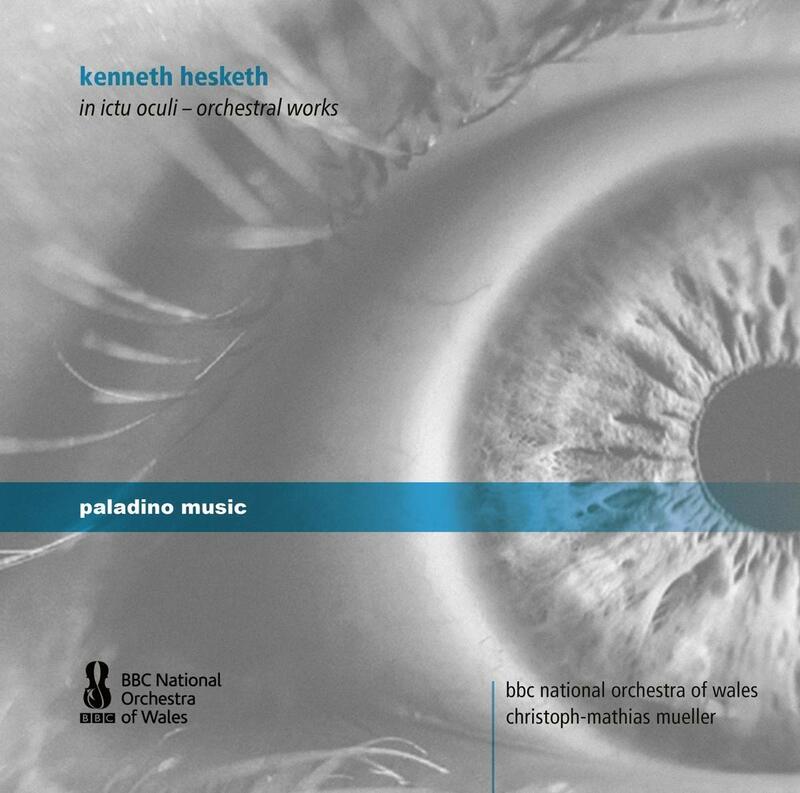 Previously I have reviewed a disc of chamber music [see my review] and Clare Hammond's disc of piano music [see my review] by Hesketh, but this is the first of his large scale orchestral works to come my way. Hesketh began composing whilst a chorister at Liverpool Anglican Cathedral, producing his first work for orchestra at the age of thirteen. At nineteen he received his first formal commission for the Royal Liverpool Philharmonic Orchestra under Sir Charles Groves. He studied at the Royal College of Music with Edwin Roxburgh, Joseph Horovitz and Simon Bainbridge, and attended Tanglewood in 1995 as the Leonard Bernstein Fellow where he studied with Henri Dutilleux. He trained as a pianist and percussionist. With the Royal Opera House's recent re-vamp now fully open, the company is showcasing the accessibility and openness of the new foyers with a series of events on Sundays in November. A Month of Sundays features an immersive programme in the building on every Sunday in November, and entry is just £5. 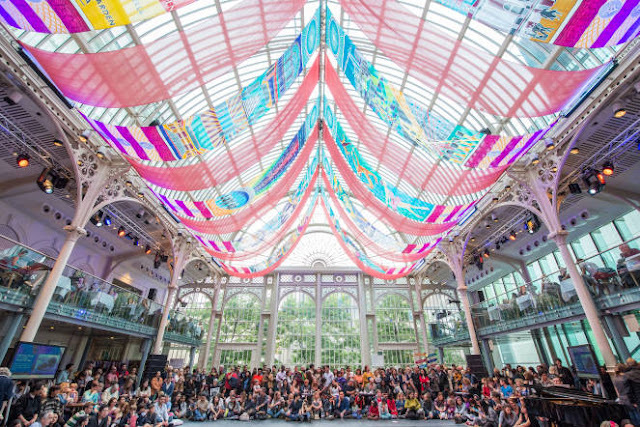 Opera, ballet and much more will fill the new (and old) spaces with everything from upcycling workshops transforming props of the past, dance workshops and the Mad Hatter’s Tea Party. Performance programmes during the month include dance duets by choreographers Hubert Essakow, Alexander Whitley and Richard Chappell, the Royal Opera Chorus in Arvo Pärt's Magnificat and George Butterworth’s The Lads in their Hundreds, New English Ballet Theatre in an extract from Wayne Eagling’s new ballet Remembrance [see my review of the ballet], a pop-up retelling of Verdi’s La traviata, a new work from Charlotte Edmonds made in collaboration with artist Hugo Dalton and Royal Ballet dancer Joseph Sissens, and performances from Lost Dog dance theatre company. 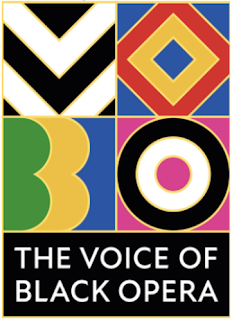 Six aspiring Black, Asian, Minority Ethnic (BAME) singers, from around the Commonwealth, will have the opportunity to showcase their talent in front of a panel of leading opera and music industry professionals at the 2018 Voice of Black Opera (VOBO) competition which takes place at St Clement Dane's Church, on 29 October 2018. Organised by the Black British Classical Foundation, the competition features six singers from around the Commonwealth. he singers will perform arias and duets, accompanied by the Band of the RAF Regiment and VOBO Strings, under the baton of Indian born Danish conductor Maria Badstue, who makes her UK début. Chairing the panel of industry experts is American tenor George Shirley. 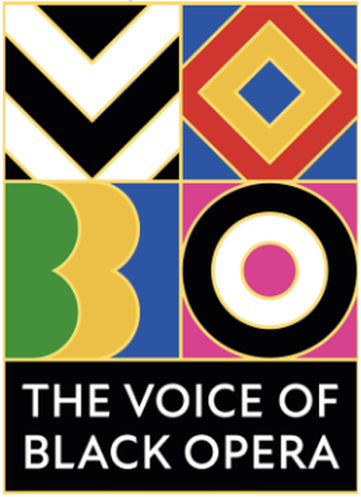 The winner of the 2018 VOBO competition will receive a £10,000 prize, a concert series and coaching with The Royal Opera. The Samuel Coleridge-Taylor Award of three paid performances is given to the finalist who gives the best performance of an aria or song by a BAME composer. On this new disc from Vivat, soprano Carolyn Sampson joins Robert King and The King's Consort, for a group of Handel's Italian cantatas, all dating from his period in Italy from 1706-1710, Armida abbandonata HWV105, Tra le fiamme HWV170, Figlio d'alle speranze HWV 113 and Agrippina condotta a morire HWWV 110. All four of these are chamber cantatas, originally intended for performance in a patron's salon. Often Handel wrote for just voice and continuo, with some like the ones on the disc adding extra instruments to the mix. Whilst Handel did perform cantatas and more intimate pieces in the houses of his patrons during his English period, the cantata form is very much associated with Handel in Italy simply because of the sheer profusion of cantatas written. And Handel would use these cantatas as a wonderful source of material for his later operas. But, though clearly operatic at times, these pieces can be more intimate than an operatic scene, and Handel was often more daring. 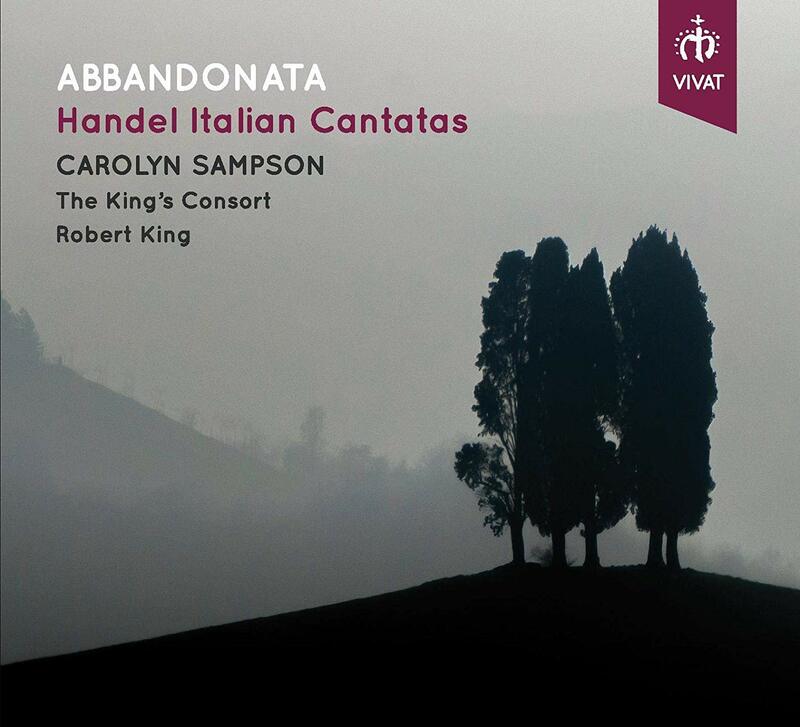 In cantatas like Agrippina condotta a morire, the desperation of the heroine is reflected in the flexibility of form, with Handel blurring the boundaries between recitative and aria. Characters in cantatas, usually but not always women, were frequently on an emotional knife-edge, and Handel reflects this brilliantly in the music. So here with have both Armida and Agrippina, but the specific character matters less than the emotional turmoil into which they are placed. That is not to say that the pieces are not bravura, but rarely is technical display for its own sake and quite often there is as much drama to be had in the recitatives. Any singer needs to bear in mind that these were chamber pieces made to be sung by Italians to Italians, the words count. Jeremy Sams has produced new English translations of Schubert's three great song cycles, each of which was premiered at the Wigmore Hall. In December 2016, Sir John Tomlinson and Christopher Glynn performed the final of the trio, Swansong (Schwanengesang) [see my review], and this has now been recorded on the Signum Classics label, along with Schubert's On the River (Auf dem Strom) and The Shepherd on the Rock performed by Glynn with Sophie Bevan (soprano), Alec Frank-Gemmill (horn) and Julian Bliss (clarinet). 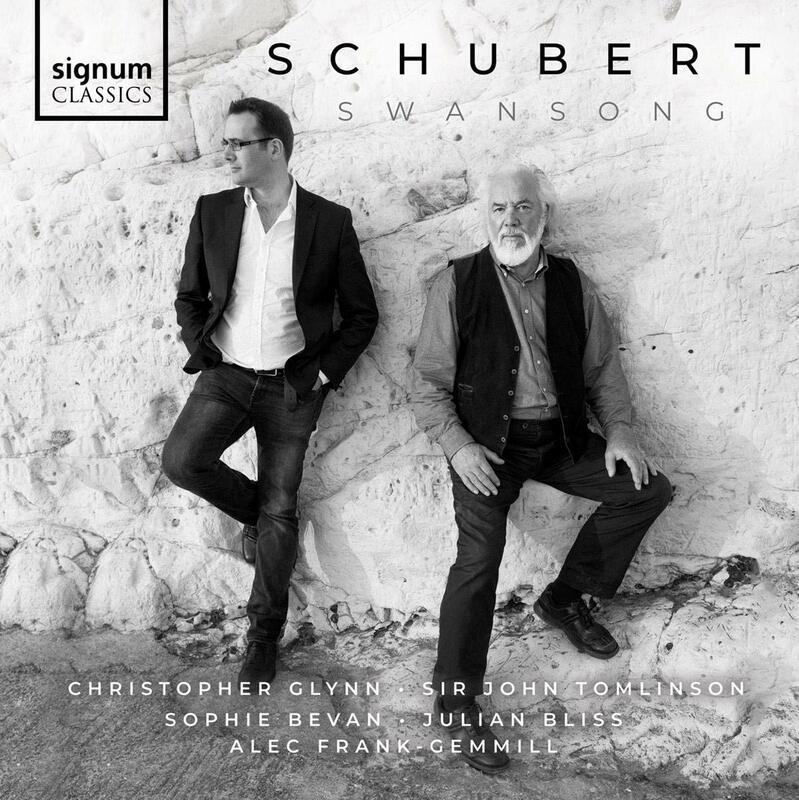 If you are going to have Schubert performed in English then I can think of no better singer to do it than John Tomlinson. Whatever language he sings in, his diction has always been superb and not just that, his way with words and the relish with which he sings them is completely riveting. With a performance like the one on this disc we return to the idea of the lied as sung poetry, with the words being of as much importance as the music. A new Welsh contemporary classical music ensemble, UPROAR, is starting with a bang with a programme of ten 5 minute works by ten Welsh composers. UPROAR's (10x10) will showcase a a cross section of composers with a wide range of experience - from those at the start of their careers to mature established composers - Andrew Lewis, Sarah Lianne Lewis, John Metcalf, Carlijn Metselaar, Gareth Moorcraft, Maja Palser, Michael Parkin, Lynne Plowman, Steph Power, Guto Puw. The programme debuts on 26 October 2018 at the Chapter Arts Centre in Cardiff and further performances are planned in February 2019 at the Bangor Music Festival. UPROAR was founded by artistic director Michael Rafferty and has its roots in the musicians who performed together in Music Theatre Wales over a 25 year period under Michael Rafferty’s direction, with the ensemble consisting of solo players. Flexible in size, with up to around twenty musicians (there are 12 musicians for the first project), and collaborative in its approach, UPROAR will create multidisciplinary projects with dance, theatre, visual arts, film and live electronics as well as performing concerts in diverse performing spaces. Further details from the UPROAR website. 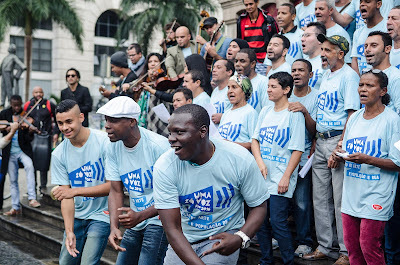 of Rio de Janeiro during the 2016 Uma So Voz Week. 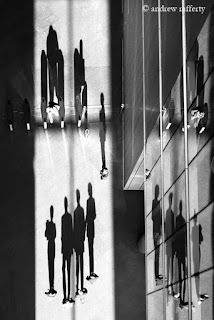 Photo: Lorena Mossa. With One Voice the international arts and homeless movement, founded by Streetwise Opera, that aims to strengthen the sector through exchanges in practice and policy, arose out of the 2012 Cultural Olympiad in London, where 300 performers took part in a showcase event at the Royal Opera House, the first time in Olympic history that a platform had been given to people who are or have been homeless. Now One Voice is set to become an independent charity, headed by Matt Peacock the founder of Streetwise Opera. Matt will leave his role as artistic director of Streetwise Opera and the company, led by co-executive directors Susie Gorgeous and Bridget Rennie will recruit a new artistic director. Since 2012 With One Voice has gone on to facilitate exchanges at the 2016 Rio Olympics, in Japan, the US and Canada. In November this year, With One Voice will host a four-day summit and week-long festival in Manchester, with over 250 delegates from fifteen countries. Half of the summit’s delegate places will be given free to people who are or have been homeless. Further information from the With One Voice website. In an age before amplification, filling large spaces with music required loud, penetrating instruments. And the ensemble of cornetts and sackbuts filled such a purpose. 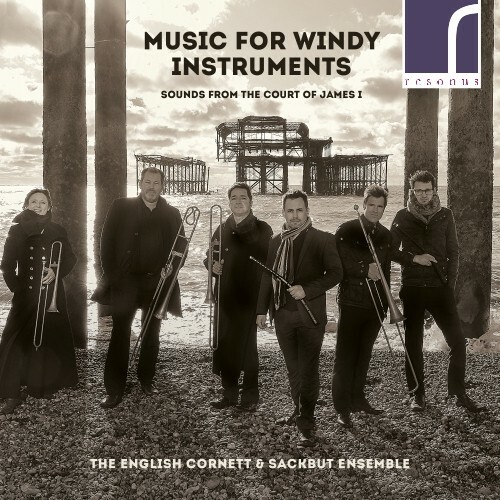 Arising out of the ensembles of shawms and sackbuts which provided outdoor dance music, in the early 17th century ensembles of cornetts and sackbuts provided music for ceremonial and court activities in the larger state rooms of the palaces at the courts of Queen Elizabeth I and King James I. Music for the more intimate privy chambers being provided by quieter, more intimate instruments. This new disc from the English Cornett and Sackbut Ensemble on Resonus Classics explores the music of the Elizabethan and Jacobean courts with a selection of 20 or so pieces for cornetts and sackbuts, and a contrasting trio of works for harpsichord. The cornett and sackbut works all come from the set of part books preserved in the Fitzwilliam Museum, the earliest layer of the manuscript being copied in 1615 and this gives us a snapshot of what the court musicians were playing. These musicians were often from the same group of families, frequently immigrant Continental musicians, and the repertoire in the manuscript suggests that the musicians kept up their Continental contacts. Premiering a new work is always exciting for a choir, but particularly so when the piece has been created by the choir's own members. This will be the case when St Peter's Singers of Leeds, director of music Dr Simon Lindley, present a new requiem on 27 October 2018 as part of the centenary commemorations of the Great War Armistice in Leeds. 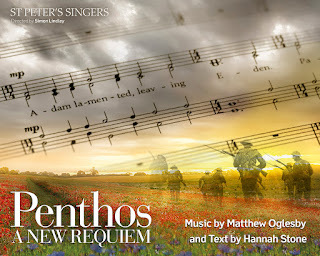 Penthos, for choir, orchestra and alto and baritone soloists, is written by composer Matthew Oglesby and poet Hannah Stone, both of whom are members of St Peter's Singers. The work takes its structure from the Requiem Mass but with a text partly inspired by the poetry of early Eastern Christian monks. Matthew Oglesby and Hannah Stone's earlier collaboration, Picking fruit on the Feast of Transfiguration, received its first performance in 2015 and was performed again to considerable acclaim at St Peter's Singers' recent recital in Leeds Minster. Penthos is being premiered on 27 October 2018 at 6pm at St Michael's Church, Headingly, Leeds in a concert which also includes music by Beethoven and Mauersberger. The choir has created a dedicated website for the work. Independent Opera was founded in 2005 and has built a reputation for supporting outstanding young artists entering the profession as William Bollinger, the Chairman, pointed out “to grow talent, you must empower it. This is the purpose of Independent Opera.” So, believing passionately about supporting new artists the organisation encourages operatic talent, through mentoring and financial support. For its showcase event, the Independent Opera’s Scholars’ Recital at the Wigmore Hall on Friday 19 October the four young singers Claire Lees (soprano), Michael Mofidian (bass-baritone), Svetlina Stoyanova (mezzo-soprano) and Ida Ränzlöv (mezzo-soprano) were accompanied by the prizewinning pianist Nino Chokhonelidze. The programme included Rossini, German lieder, Scandinavian song and a world premier from the Latvian composer Eriks Ešenvalds. The composer Sir Charles Villiers Stanford is so well known, that it seems surprising that he has a significant body of major work which is still rarely, if ever performed. Yet his Mass Via Victrix (1914-1918) is receiving its first performance on 27 October 2018. It is a major, mature work, Stanford wrote it during the First World War and the vocal score bears the date December 1919 (by which time Stanford would be 67). Though Boosey and Hawkes published the vocal score, the work was never fully performed, only the Gloria being given in a version with organ. Mass Via Victrix (1914-1918) is a large scale concert work, for four soloists, chorus and orchestra, and its belated premiered is at BBC Hoddinott Hall in Cardiff on 27 October 2018 when Adrian Partington conducts the BBC National Chorus and Orchestra of Wales with soloists Kiandra Howarth, Jess Dandy, Ruairi Bowen and Gareth Brynmor John. The work was prepared for performance from Stanford's autograph manuscript by the Stanford scholar Jeremy Dibble (Reader of Music at the University of Durham and author of the standard biography on Stanford), and I spoke to him via Skype to find out more about the background to the mass. I was curious as to why the work was not performed, especially as Stanford clearly intended it to be a World War One commemoration (it includes the date 1914-1918 in the title. Jeremy Dibble feels that Stanford was something of a casualty of the change in musical attitudes after the war. In fact, Stanford touted a number of large scale works round publishers, failing to get them placed. 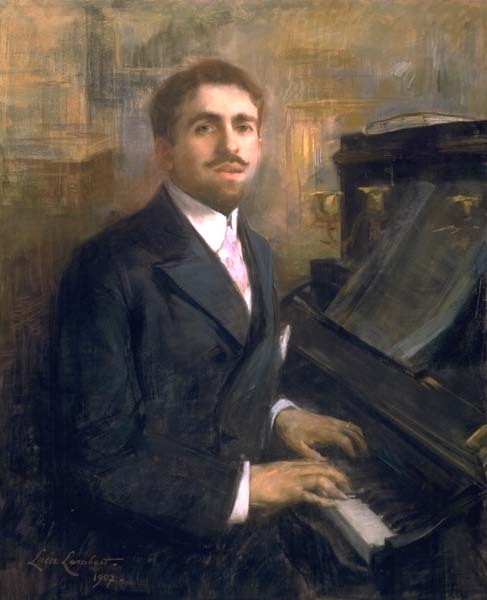 His style was seen as somewhat old-fashioned, and he was very much associated with German music (as well as Cambridge, he studied in Berlin and Leipzig and held Brahms very much as an exemplar). Unfortunately attitudes had changed as a result of the war, so he failed to find publishers for his Second Violin Concerto and his Fifth Irish Rhapsody (which was dedicated to the Irish Fusiliers). This year's Oxford Lieder Festival celebrates The Grand Tour - A European Journey in Song. Besides the more obvious stops, there are lesser known ones and I went along on Wednesday 17 October to visit Estonia [of which more in my review of the rush-hour and evening concerts] and Italy. The lunch-time recital at the Sheldonian Theatre was a programme of songs by Bellini, Donizetti, Verdi and Tosti, along with Reynaldo Hahn's Venezia performed by tenor Alessandro Fisher and pianist Gary Matthewman. Before the recital there was a talk at the Ashmolean Museum by Michael Winterbottom, curator of sculpture and decorative arts at the museum, exploring Italy and the Grand Tour, and in the afternoon the Italian theme continued with Jessica Goodman talking about the Commedia dell'arte. For their recital at the Sheldonian Theatre, Alessandro Fisher and Gary Matthew began with a group of Bellini songs all dating from 1829 (the year Bellini wrote La straniera). These are not as complex as the operas, they are essentially ariette created for the salon or the parlour, and all about the voice with the piano as basic support (often with a simple oom-pah bass rhythm). For Malinconia, Ninfa gentile, Alessandro Fisher gave us a lovely Italianate line with melodies which really flowed. Per pieta bell'idol mio was a little bit closer to an aria, with drama in the piano introduction and in the vocal line. Fisher displayed a fine tenore di grazia type voice, with lovely event tone through the range and a nice combination of vibrancy and ease. He did not make the mistake of trying to do too much with the songs, yet put each one over with engaging grace. The final one of the Bellini group, Ma rendi pur contento was quietly moving, almost an operatic cavatina we rather missed the caballetta afterwards. 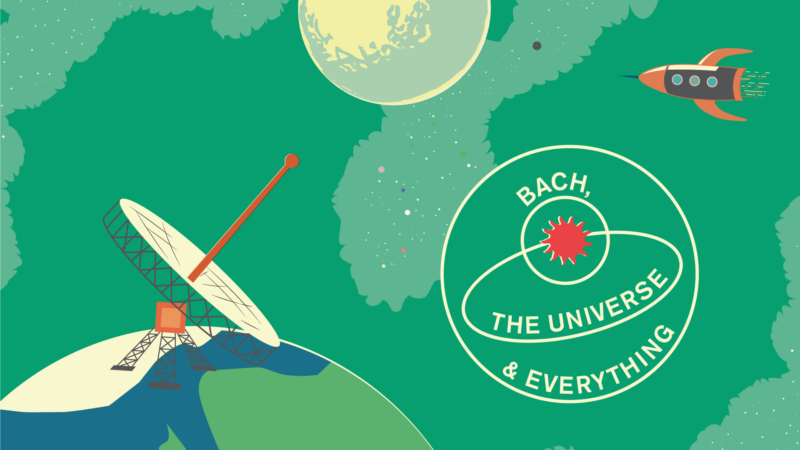 The second series of the Orchestra of the Age of Enlightenment's Bach, the Universe & Everything launches at Kings Place on Sunday 21 October 2018 with How to Leave the Planet. The series runs monthly and provides a unique combination of music and science with the performance of a Bach cantata and a scientific talk. On Sunday, 21 October, Dallas Campbell talks on the past and future of space travel, ending with the ‘Cavatina’ from Beethoven’s String Quartet No. 13 in B-flat Major - the final track on the ‘Golden Record’ sent into space with the Voyager satellite. Audiences can mingle afterwards to discuss the science and music over coffee and cake, while enjoying interactive activities on the science of sound. The Bach cantata performed is Cantata: Was soll ich aus dir machen (‘How shall I give thee up, Ephraim?’), BWV 89, with soloists Rowan Pierce, Clara Hendrick and James Newby, one which looks at the world from God's perspective. This year's Oxford Lieder Festival is celebrating the Grand Tour, and as well as the major stops in European music we have some less well known musical cultures. As part of my day at the festival on Thursday 17 October 2018, I caught their visit to the Baltic. The evening recital was given by the Estonian mezzo-soprano Kai Rüütel and pianist Roger Vignoles; From Tallin to St Petersburg gave us a flavour of the various influences in Estonian music with songs by Estonian composers from the 19th and 20th centuries, Russians Sergei Rachmaninov and Nikolai Rimsky-Korsakov and the German Johannes Brahms (who was from the Hanseatic port of Hamburg). The rush hour concert was given by the Scottish group Mr McFall's Chamber who presented a programme of Baltic instrumental music, with works from Estonia, Latvia and Finland, including some Finnish tango! And to give us a flavour of the Estonian language being sung in the evening, the day started with a useful Estonian language lab, where Kerli Liksor introduced us to the basics of the Estonian language. For the evening concert at Holywell Music Room, Kai Rüütel and Roger Vignoles' programme From Tallinn to St Petersburg brought out the different foreign links to Estonian music. Though a Russian colony in the 19th century, Estonia had a long tradition of being locally governed by a German merchant class thanks to the Hanseatic links. So whilst 19th century composers went to study in St Petersburg, the peasants also adopted German habits which is where how the Estonian tradition of communal song developed. Rüütel had clearly put a lot of thought into the programme, not only did she sing the entire thing from memory but she had contributed English translations to many of the Estonian songs. Luckily the programme was being recorded by the BBC for broadcast on BBC Radio 3 at some future date. We started with a song by Miina Härma (1864-1941), I cannot stay silent. 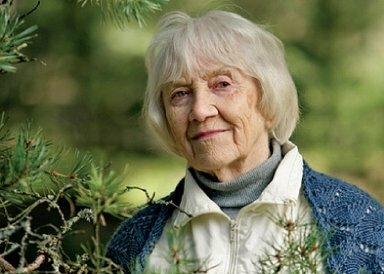 Härma studied at the St Petersburg Conservatoire, and is still revered in Estonia as a choral composer and conductor and in fact I cannot stay silent (written in 1896) is often sung by choirs. An elegiac, folk-like piece, Rüütel sang it unaccompanied. The Brahms group followed, four songs from his Fünf Lieder, op.105 written between 1885 and 1886. Wie Melodien though nicely flowing was perhaps a little too sober and serious, but it did give us a fine flavour of Rüütel's rich-toned mezzo-soprano. She relaxed more into Immer leiser wird mein Schlummer which was beautifully shaped with a sense of a still, quiet centre, and a moment of vibrant drama towards the end. Klage was lighter and more characterful, though still with a serious demeanour. Auf dem Kirchhofe started with Roger Vignoles' dramatic piano, and the vocal line had the feeling of dramatic recitative, again very focused, serious and intent. A group of songs by Sergei Rachmaninov (1873-1943) followed. In the silence of the forest was full of melancholy longing, with its evocatively chromatic piano and richly romantic vocal line, sung by Rüütel with lots of vibrant yet focused tone. The Soldier's Wife was still melancholy, yet a little folk-inspired with a haunting melismatic passage at the end. How fair is this spot flowed beautifully, moving from a sense of longing to a radiant end. Pianist James Willshire has been celebrating the 100th anniversary of Debussy's death by presenting the composer's piano music throughout the year in Glasgow, Edinburgh, Leeds and Manchester. This culminates in Willshire's Debussy Festival, a two day event in Edinburgh on 1 & 2 December 2018 at the newly refurbished St Cecilia's Hall, a Georgian concert hall. Dating from 1763 the hall is Scotlands oldest purpose-built one (Oxford's Holywell Music Room dates from 1748) and now part of Edinburgh University. The weekend features eight concerts and two pre-concert talks. Willshire himself will be presenting a journey through Debussy's works for solo piano, more than five hours of music presented in five recitals during the two days, from the very early music to the demanding late pieces such as the Etudes. There will also be a concert of Debussy's chamber music from Philippa Harrison (piano), Mark Bailey (cello) and Gongbo Jiang (violin), and two vocal recitals with John Cameron (piano) accompanying Jessica Leary (soprano), Judy Brown (mezzo-soprano), Jemma Brown (soprano) and Kimberley Dove (soprano). In February this year James Willshire accompanied viola player Rosalind Ventris in the premiere of my Three Pieces from the Book of Common Prayer at Cheltenham Music Society [see my article]. Full details from the St. Cecilia's Hall website (opens as PDF), tickets from EventBrite.